Objective: Detect the presence of Burnout and bereavement support of health professionals in oncology and pediatric intensive care units in Chilean public hospitals. Subjects and Method: Transversal design of descriptive correlational type. Auto-evaluation using the Maslach Burnout Inventory and Grief Support Health Care Scale instruments in 210 professionals and technicians. For the analysis of a means comparison, the t-student test was used and for the comparison between the variables, the correlations of Pearson and Spearman were used, considering a level of significance of 5%. Results: 4% of the participants presented with Burnout and 71% were at risk of suffering it. 52% had a high level of perception of bereavement support, especially in women and oncology personnel. When correlating support in bereavement and Burnout, the data suggests that both the recognition of the bond, as well as the loss after death of a patient, helps decrease the depersonalization of the professional and improves their personal fulfillment. Conclusion: Professionals in areas of high pediatric complexity are at high risk of Burnout, due to greater emotional exhaustion and low personal accomplishment. However, a greater perception of recognition and support in their bereavement is a factor that can reduce that risk. Therefore, continuous intervention programs are required within these units, with concrete strategies for accompaniment, teamwork and mourning rituals. During the last decades, modern medicine has experimented with important medical technologies that allow people to extend, artificially, the lives of people1. This phenomenon made its focal point the healing of diseases and the extension of life2, which has led us to think of death with a negative connotation instead of accepting it as another stage of life3,4,5. Thus, death has a greater significance to health teams focused on taking care of children with severe diseases, such as cancer, since the death of child is incomprehensible6. This might affect every member of the team in a different way depending on their relationship with the patient, the time spent with them and their level of training, which can lead to grieving processes6,10; these are general patterns in response to the loss of someone important to them11. The feeling of loss, along with insecurity, fatigue, and frustration at work can cause Burnout Syndrome, which is described as a psychological response to work stressors, interpersonal and emotional12,13. This syndrome occurs due to physical health problems, anxiety, lack of motivation, low self-esteem, and sense of isolation, among others. This pathology occurs more frequently in members of high-complexity units, such as oncology and pediatric intensive care14, 15, especially in members with a lower level of training6, 16. Members have to take care of children with cancer in both units, which requires the management of long-term, intensive and highly toxic treatments, which demand a growing care demand17, along with organizational factor such as lack of staff, communication deficit, surrogate decision-making, role conflicts, complex work schedules, incompatibility between personal life and work, and short rest periods18. There are factors exposed to professionals and technicians, high levels of stress due to the continuous connection with death, feelings of impotence, situations of conflict, the lack of support measures and psychological support in the institution, which can lead to a lower job performance, an increase of absenteeism, higher risk of errors and omissions13,17. In addition, they affect the quality of the assistance and the quality of the care given to patients18,19. Hence, these difficulties become relevant in aspects of workplace health and in the contribution in the improvement of the attention quality of public hospitals. In addition, a set of research showed that the social support for health staff is an important intermediary in the development of Burnout, helping to relieve stress and allowing to confront death in the best way possible and the daily work in high-complexity services20,21. Nevertheless, this support is focused on social aspects and not to support directly the mourning in the team and in the institution22,23. Regarding attendance for children and teenagers with cancer in Chile, the Children’s Cancer Program (PINDA) has prioritized the development of a high-quality attendance that has allowed significant results in survival, similar to what has been achieved by developed countries24. However, most of the patients die because of severe complications, in oncology and intensive care unit25. In spite of this, no transversal and formal coping intervention of workplace stress or coping for losses exist in oncological pediatric teams and intensive care25, only for specific punctual interventions, which has become a challenge for medical teams25. The focus of this study is to describe the level of Burnout and the perception of support in case of mourning for members of oncological and intensive care units, in medical centers related to the PINDA program, and to identify the correlation between these two variables. There’s a correlational cross-sectional study, where 210 professionals and technicians participated, who worked in oncology and intensive care units in the public area of five PINDA medical centers in the “Región Metropolitana”, which shows a rejection rate of 30%. The estimation of the sample size was of 150 patients, which was made with an expected variance of nine, to find statistically significant differences, considering a signification level of 0.05 and a potency of 80%, estimated according to Sokal & Rohlf26. The criteria for inclusion were being recruited as a member of oncology or pediatric intensive care in the hospital, have worked for more than three months in the units and accept to participate voluntarily. The criteria for exclusion were being in the grieving period, or not to have experienced a patient’s death. The investigation considered variables such as level of Burnout, the perception of support during the grieving period and sociodemographic aspects of the studied people. Thus, the instruments used were the Maslach Burnout Inventory (MBI), in Spanish, by Maslach and Jackson (1982)27 to measure the level of Burnout. This book was validated by Seisdedos (1997)28 and in Chile, by Jelvéz (2011)29, reaching an internal consistency with a coefficient alpha of 0.89, by Croanbach. This instrument evaluates three variables of the Burnout Syndrome: emotional exhaustion, depersonalization, and personal fulfillment. It includes 22 items that are assessed on a scale like Likert with scores from 0 to 6, corresponded to different levels of frequency. A high level of Burnout is determined when the emotional exhaustion sub-scale is above 20 points, depersonalization sub-scale above 9 points and the personal fulfillment sub-scale is below 34 points. The second instrument used to evaluate the perception of support during the grieving period was the “Grief Support Health Care Scale” (GSHCS), developed by Anderson, Ewen and Miles (2010)30, which was validated in Chile by Vega et al. (2014)31, and reaching an internal consistency with a coefficient alpha by Cronbach of 0.81. This instrument was developed taking into account the 3 components of the Theory of Disenfranchised Grief32: recognition of the bond, recognition of the losses and inclusion of burial rituals. The GSHCS is composed of 15 items. To measure the level of agreement or disagreement of these items, a Likert scale of 5 points is used. A high score indicates a high level of perception of support during the grieving period. For the development of the project, they had the authorization of the Administrators of each hospital and the approval of the Research Ethics Committee of the School of Medicine of the Pontifical Catholic University of Chile and the ethics committee of each Health Service according to each hospital, making use of the instruments of measurement between March and November 2015. The professionals and technicians were invited to participate via posters. and contacted via assistants in the units. If the patients accepted to participate, the process of informed consent began and they proceeded with the use of the instruments. The patients kept these documents in coded sealed envelopes, in order to protect the confidentiality and the anonymity of the participants. Those staff members who had a high level of Burnout, according to the MBI, were contacted by phone by the principal investigator, who oriented them to consult the psychologist of their hospital, and they also were invited to a support psychoeducational intervention, developed by the psycho-oncologist of the team. In the statistical analysis, a student’s t-test for independent samples was used in the comparison of the averages, before the verification of the assumptions of normality and homogeneity of the variances. The comparison between the scores of both variances, Burnout and Disenfranchised Grief, was carried out by Pearson and Spearman correlations, depending on the nature of the variables, considering a level of significance of 5%. A statistical R software 3.3.1 was used33. The total number of staff members was 210, 188 women and 22 men, with an average age of 39 years (range from 20 to 64 years). 36% of the participants in the study were married or had a partner, and from the 210 patients, 53% of them had children. Regarding their work, 130 participants worked in the oncology unit and the rest in the intensive care unit. 114 participants had academic training, e.g. doctors, nurses, kinesiologists, psychologists, occupational therapists, nutritionists and social workers, and 96 had technical studies. 75% corresponded to team nursing. Regarding their labor seniority, 53% had less than 5 years in the unit, with a range of 4 months and 40 years. With regard to grief training, 29% of the participants had attended a course or capacitation program (Table 1). When we analyze the total score of the level of Burnout, 4% of the participants had high levels of Burnout when the study was made and 71% was likely to develop Burnout. 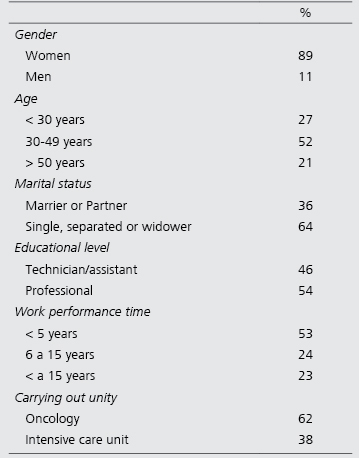 After analyzing the sociodemographic characteristic regarding these total scores and every dimension of Burnout, there were no differences depending on gender, age, level of training and performing unit (Table 2). However, the datum indicated that 45% of the patients showed a medium or high level of emotional exhaustion, patients of the oncology unit had higher levels than patients of the intensive care unit, the difference was not quite significant (p-value: 0.39). Equally, when they analyzed the third dimension of Burnout, it was impressive that 82% of the sample showed a low or medium in personal fulfillment (Table 3). Regarding the support during the grieving period, from the total of participants, 52% showed a high level of perception of support, the recognition of the bond the dimension with the highest score. It is important to notice that there were no participants with low levels of support during the grieving period, although, the dimension of funerary rituals got the lowest scores (Table 4). With respect to the demographic characteristic, there were differences of significance only in the support during the grieving period and in the unity of performance. 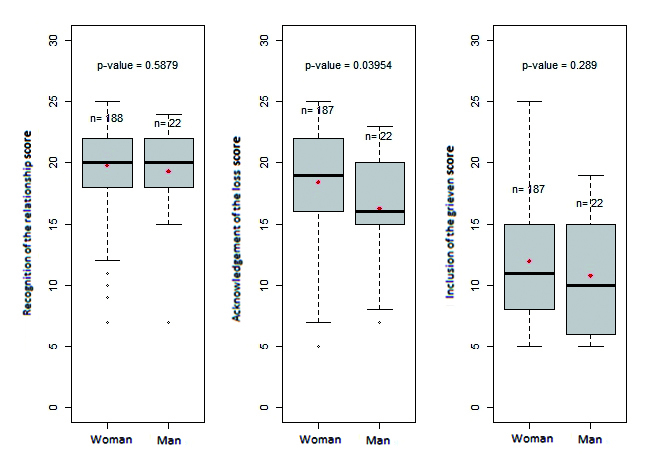 That is how women got a higher score in the recognition of the losses, in comparison with men (p-value = 0.039) (Figure 1). 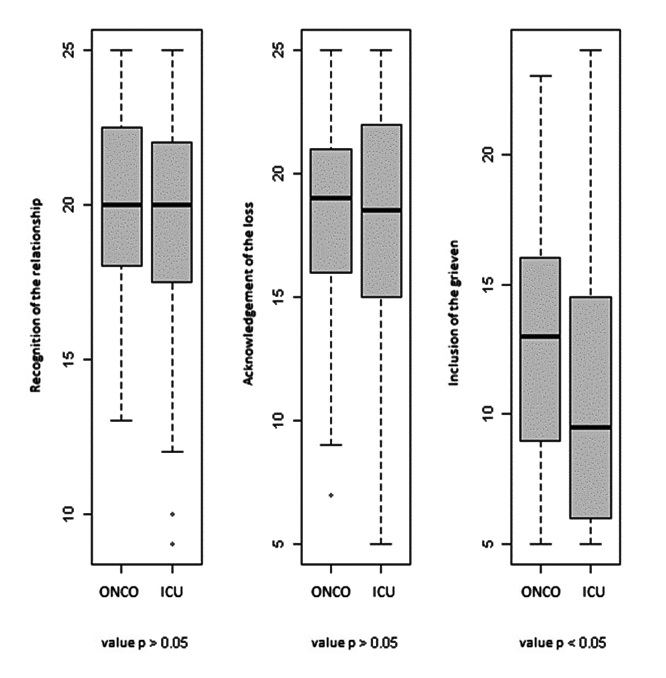 Additionally, professionals from the oncology units got higher scores in funeral rituals, in comparison with those who work in intensive care units (p-value = 0.024) (Figure 2). Figure 1. Dimensions of grief support perception according gender of professionals. Figure 2. Dimensions of grief support perception according carrying out unity. 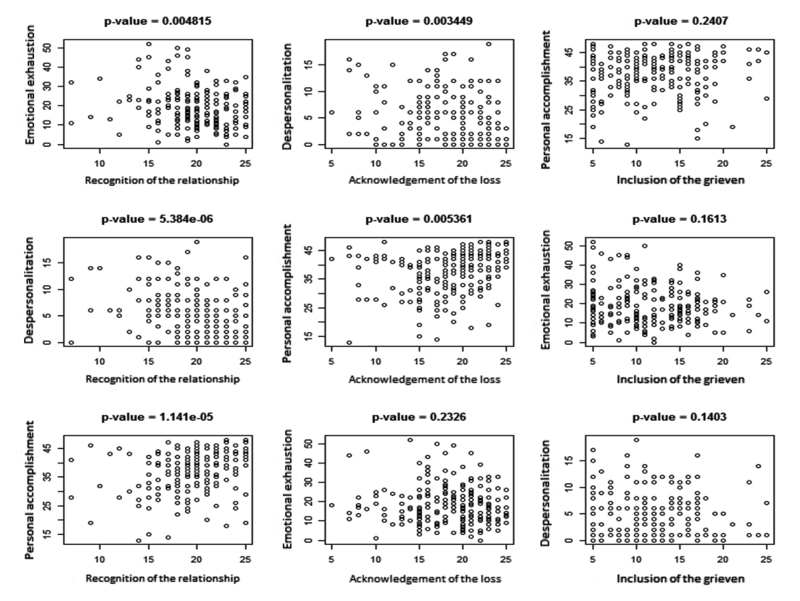 When we analyze the Maslach and GSHCS instruments in three dimensions for each one, it is possible to observe that there is a statistically significant correlation in five of the nine correlations. Thus, the recognition of the bond correlated negatively with the value of emotional exhaustion (p-value < 0.05), depersonalization (p-value < 0.005) and personal fulfillment (p-value < 0.05). Regarding the recognition of the loss, this one correlated negatively with depersonalization (p-value < 0.005) and personal fulfillment (p-value 0.05). Therefore, professionals and technicians who recognized their bond with the patient and their loss had a higher chance of developing Burnout. It is important to notice that funeral ritual did not affect the progress of Burnout (Figure 3). Figure 3. Matrix of correlations of the dimensions of the MBI and GHSCH instruments. The obtained results show that there are no differences of significance in the prevalence of Burnout Syndrome regarding the analyzed sociodemographic variables, such as gender, age, marital status, work unity, seniority at work, attendance in grieving courses and number of children, which is also true for other research made on professionals of the pediatric area34,35. In relation to the presence of this syndrome in the studied population, we obtained similar results in a research made on Chilean professionals in the pediatric critical care unit34. However, there is a study of workers of a Chilean pediatric hospital, which shows a presence of 30% in them, mostly in the staff of the oncological unit16. It should be noted that if we compare this level with the prevalence of Burnout in adult care units, the levels are higher, reaching numbers above 40%36,37,38. With respect to the dimensions of Burnout, the datum of this study shows that around 70% of the patients are likely to develop Burnout, mostly because of the high emotional exhaustion and low personal fulfillment. These numbers are highly important since the emotional exhaustion variable is a key factor in the predisposition to Burnout39,40. It should be noted that the instrument MBI was used to evaluate the level of Burnout in every study. On the other hand, much research has associated the development of Burnout with variables such as social support and highly complicated grieves21,35,38,41. In those studies, is noted that the cohesion and social support is a key factor that is negatively correlated with the appearance of this Syndrome39. Regarding this, this study revealed that there are differences in the perception of support during the grieving period depending on gender, women feel more recognized when they lose a patient than men, which has been noticed both in pediatrics and in the adult area20,35. At the same time, when the perception of support and the development of Burnout are correlated, the datum shows that professionals, who are recognized for their bond with their patient and their loss after the death of the patient, will be less likely to develop Burnout, mostly because of the dimensions of depersonalization and personal fulfillment. When we consider the involvement and incorporations in funeral rituals of the patients, we observed that the professionals who work in the oncology area feel more supported, in comparison with professionals in the intensive care units; however, this incorporation is not correlated with the development of Burnout. These results show that not only the support is important in the Burnout syndrome, but also the own perception of the professionals of feeling supported during their grief and the recognition of their connection with their patients. Despite that in this research, the participation in rituals is not relevant, it has been demonstrated that carrying out funeral rituals in teams generates containment instances and lowers the risk of long-term grieves in professionals32. One of the limitations of this study was, first, the number of professionals and technicians that participated, since it would have been more interesting if more professionals were interested, especially doctors, psychologists, and kinesiologists. On the other hand, the low level of participation in some hospitals did not allow us to make local analyses. It would be interesting if we study this variable in professionals of the adult area. Professionals of high-complexity pediatric units show a high risk of developing Burnout, due mostly to higher emotional exhaustion and low personal fulfillment. Nevertheless, a higher perception of recognition and support in their grieves is a factor that can help to decrease said risk, without ignoring that there are other institutional factors that influence in this situation12,29,49. Thus, social support is a priority in medical teams, since the great need that workers feel in the connection with the patient, which is not only recognized by the family, but also by the institution, and all those who are exposed to the loss of a child19,41,42. Some studies have demonstrated the connection between the professional and the patient, recognized even by the medical team, generate a more individualized and important attendance and care, which would raise the personal fulfillment42 and decrease the need to rotate staff43. It is observed in attitudes of enthusiasm, dedication, confidence, enjoyment at the work and emotional support between workers41,43. Therefore, it is important to create induction activities, training, teamwork, effective communication, auto-efficiency strategies and coping with losses, inside institutions and units that can allow units to organize their responsibilities and auto-care, respecting the balance between work life and personal life18,42,44. Studies show that implementing informal strategies is not enough, it is also required to implement programs of formal intervention, implemented early and carried out regularly, as well as during losses of patients that were important for the team35,42,44. During these interventions, real strategies must be handed over to allow staff members to recognize their bonds, suffering, and losses, as a way to start working on them32,44. 1. Coca C, Arranaz P, Diéz-Asper H. Burnout en el personal sanitario que atienten a niños al final de su vida y a sus familiares. In: Gómez Sancho M, editor. Cuidados paliativos en el niño. España: Lerko/GAFOS; 2007;167-88. 2. Flores R. Salud, Enfermedad y Muerte: Lecturas desde la Antropología Sociocultural. Revista MAD Universidad de Chile. 2004 [Internet] May; 10. Disponible en: http://www.rchdt.uchile.cl/index.php/RMAD/article/viewFile/14783/15122. 3. Caycedo M. La muerte en la cultura occidental: antropología de la muerte. Rev Colomb Psiquiat. 2007;36(2):332-9. 4. Pacheco G. Perspectiva antropológica y psicosocial de la muerte y el duelo. Cultura de los Cuidados. 2003;7(14):27-43. 5. Gala FJ, Lupiani M, Raja R, Guillén C, González JM, Villaverde MC, Sánchez A. Actitudes psicológicas ante la muerte y el duelo: Una revisión conceptual. Cuad Med Forense 2002;(30):39-50. 6. Plante J, Cyr C. Health care professionals` grief after death of child. Paediatr Child Health. 2011;16(4):213-16. 7. Gómez Sancho M. Los niños y la muerte. En Gómez Sancho M. Avances en cuidados paliativos. Palmas de Gran Canarias: GAFOS; 2003;539-81. 8. Del Rincón C, Martino R, Catá E, Montalvo G. Cuidados paliativos pediátricos: el afrontamiento de la muerte en el niño oncológico. Psicooncología. 2008;5(2-3):425-4. 9. Zadeh S, Gamba N, Hudson C, Wiener L. Taking care of care providers: A wellness program for pediatric nurses. JPON. 2012;29(5):294-9. 10. Grau J, Llantá MC, Massip C, Chacón M, Reyes MC, Infante O, Romero T, Barroso I, Morales D. Ansiedad y actitudes ante la muerte: revisión y caracterización en un grupo heterogéneo de profesionales que se capacita en cuidados paliativos. Pensamiento Psicológico 2008;4(10):27-58. 11. Neimeyer R. Aprender de las pérdidas. Ed. Paidós. Barcelona. 2002. 12. Gil Monte P. El síndrome de quemarse por el trabajo (burnout): una enfermedad laboral en la sociedad del bienestar. Ediciones Pirámide. Madrid. 2005. 13. Spinetta J, Jankovic M, Arush M, Eden T, Epelman C, Greenberg M, et al. Guidelines for the recognition prevention, and remediation of burnout in health care professionals participating in the care of children with cancer: report of the SIOP working committee on psychosocial issues in pediatric oncology. Med Pediatr Oncol. 2000;35(2):122-5. 14. Crowe C. Burnout and self-care considerations for oncology professionals. J Pain Manage 2015;8(3):191-5. 15. Papadatou D, Martinson IM, Chung PM. Caring for dying children: a comparative study of nurses’ experiences in Greece and Hong Kong. Cancer Nurs 2001;24(5):402-12. 16. Órdenes N. Prevalencia de burnout en trabajadores del Hospital Roberto del Río. Rev Chil Pediatr. 2004;75(5):449-54. 17. Hinds P. Testing the stress-response sequence model in pediatric oncology nursing. JOPON. 2000;17(2):59-68. 18. Satos A. Do s M. Estresse e Burnout no Trabalho em Oncologia Pediátrica: Revisão Integrativa da Literatura Psicologia: Ciência e Profissão. 2015;35(2): 437-56. 19. Ramalho M, Nogueira M. Vivências de profissionais de saúde da área de oncologia pediátrica. Psicologia em Estudo. 2007;12(1):123-32. 20. Maza M, Zavala M, Merino J. Actitudes del profesional de enfermería ante la muerte de pacientes. Cienf. 2008;15(1):39-48. 21. Grau A, Suñer R, García M. Desgaste profesional en el personal sanitario y su relación con los factores personales y ambientales. Gac Sanit. 2005;19(6):463-70. 22. Folkman S. Revised coping Theory and the process of Bereavement. En Stroebe M, Hansson O, Stroebe W, Schut H. Handbook of Bereavement research: Consequences, coping, and care. Washington, DC: American Psychological Association. 2003;563-84. 23. Liben S, Papadatou D, Wolfe J. Paeditric palliative care: changes and emerging ideas. The Lancet. 2008;371:852- 64. 24. Vargas L. Cáncer en pediatría. Aspectos generales. Rev Chil Pediatr 2000; 71: 283-5. 25. Rodríguez N, Palma C, Santander J, Cariqueo C, Varas M, Errázuriz MJ. Protocolo Alivio del dolo y sufrimiento y Cuidados Paliativos del Niño con Cáncer. Santiago: MINSAL; 2008. 26. Sokal R. Rohlf F. Biometry. 3ª ed. Freeman & Co: San Francisco; 1994. 27. Maslach C, Jackson SE. Maslach Burnout Inventory. Research Edition. Palo Alto, CA: Consulting. Psychologist Press; 1981. 28. Seisdedos, N. Manual MBI, Inventario de Burnout de Maslach. Madrid: TEA;199722. 29. Jélvez C, Ibáñez JP, Olivares V. Validez Factorial del Marslach Burnout Inventory Human Services en profesionales chilenos. Ciencia & Trabajo. 2011; 41:176-80. 30. Anderson K, Ewen H, Miles E. The Grief support in Healthcare Scale. Nur Res. 2010;59(6):372-9. 31. Vega P, Melo J, González R, et al. Validación de escala de apoyo en duelo en atención de salud para población hispanoparlante. Psicooncologia. 2015;12(2-3):355-66. 32. Doka KJ. Introducción. En Doka KJ. Disenfranchied grief: new direction, challengers, and strategies for practice. Champaign, IL: Reserarch Press. 2002:528. 33. R Core Team R. A language and environment for statistical computing. R Foundation for Statistical Computing, Vienna, Austria. 2016. URL https://www.R-project.org/. 34. Jofré V, Valenzuela S. Burnout en personal de enfermería de la unidad de cuidados intensivos pediátricos. Revista Aquichan. 2005;5(1):56-63. 35. Adwan J. Pediatric Nurses’ Grief Experience, Burnout and Job Satisfaction. JPN. 2014;29:329-36. 36. Castillo A, Benavente S, Arnold J, Cruz C. Presencia de síndrome de burnout en Hospital El Pino y su relación con variable epidemiológicas. Revista Anacem 2012;6(1):9-13. 37. Avendaño C, Busto P, Espinoza P, García F, Pierart T. Burnout y apoyo social en personal en el servicio de psiquiatría de un hospital público. Ciencia y Enfermería. 2009;15(2):55-8. 38. Muñoz M, Molina P. Síndrome de Burnout en el Equipo de Salud de una Unidad de Cuidados Intensivos, Concepción. Revista Chilena de Medicina Intensiva. 2013;28(1):7-12. 39. Aranda C, Pando M, Pérez MB. Apoyo social y síndrome de quemarse en el trabajo o burnout: Una revisión. Psicología y Salud. 2004;14(1):79-87. 40. Demirci S, Kuzeyli Y, Ozsaran Z. Uslu R. Yalman D, Arif B. Evaluation of burnout syndrome in oncology employees. Aras Med Oncol. [Internet] 2010;27:968-74. 41. Wenzel J, Shaha M, Klimmek R, Krumm S. Working through grief and loss: oncology nurses’ perspectives on professional bereavement. ONF. [Internet] 2011;38(4);272-82. 42. Vega P, González R, Palma C, Oyarzún C, Ahumada E, Mandiola J, Rivera M. Develando el significado del proceso de duelo en enfermeras(os) pediátricas(os) que se enfrentan a la muerte de un paciente a causa del cáncer. Revista Aquichan. 2013;13(1):81-91. 43. Liakopoulou M, Panaretaki I, Papadakis V, et al. Burnout, staff support, and coping in pediatric oncology. SCC. 2008;16(1):143-50. 44. Keene E, Hutton N, Hall B, Rushton C. Bereavement debriefing sessions: an intervention to support health care professionals in managing their grief after the death of a patient. PN. 2010;36(4):185-9. This research was funded by CONICYT, through the National Health Fund. Project. SA 14 IID0032. The research team would like to thank to every professional and technic who participate in this study, and who voluntary accepted attend to the psicoeducative intervention for the acquisition of tools for the prevention of the Burnout syndrome and grief confrontation, which accompany in this study. Also, to the nursing students, who with dedication make possible the data obtaining.